Traditionally, Autonomous Guided Vehicles (AGVs) were mostly used at manufacturing systems, but currently, other applications of AGVs are extensively developed in other areas, such as warehouses, container terminals and transportation systems. The problem of path planning for AGV is a significant case while multiple AGVs are employed in the system [1T. Sasaki, G. Enriquez, T. Miwa, and S. Hashimoto, "Adaptive path planning for cleaning robots considering dust distribution", J. Robot. Mechatron., vol. 30, no. 1, pp. 5-14. [http://dx.doi.org/10.20965/jrm.2018.p0005] -3M. Kitamura, Y. Yasuoka, T. Suzuki, Y. Amano, and T. Hashizume, "Path planning for autonomous vehicles using QZSS and satellite visibility map", J. Robot. Mechatron., vol. 25, no. 2, pp. 400-407. [http://dx.doi.org/10.20965/jrm.2013.p0400] ]. An Automated Manufacturing System (AMS) is a complex network of machines and devices so that demands are fulfilled and production tasks are determined for all components accordingly [4S. Hoshino, and K. Uchida, "Interactive motion planning for mobile robot navigation in dynamic environments", J. Adv. Comput. Intell. Intell. Inform., vol. 21, no. 4, pp. 667-674. [http://dx.doi.org/10.20965/jaciii.2017.p0667] ]. For the methods and techniques of path planning, different aspects are studied in the past. Unlike previous stochastic optimization methods which use expected values instead of probability distribution as length or cost of each arc in stochastic methods [5M.H. Olya, B. Shirazi, and H. Fazlollahtabar, "Adapted dynamic program to find shortest path in a network having normal probability distribution arc length", Adv Ind Eng Manage, vol. 2, no. 1, pp. 5-10.] proposed a novel general stochastic dynamic programming approach which is not only a dynamic method instead of a being static method but also it generates integrated probability functions at the end of each path in networks and compares probability distributions instead of expected values of each arc to find the shortest path in the network. In addition [6M.H. Olya, "Finding shortest path in a combined exponential–gamma probability distribution arc length", Int. J. Operat. Res., vol. 21, no. 1, pp. 25-37. [http://dx.doi.org/10.1504/IJOR.2014.064020] ], implemented his method on different combinations of probability distributions and compared the results based on cost criterion to show the superiority of his developed method [7M.H. Olya, and H. Fazlollahtabar, "Finding shortest path in a combined exponential-gamma-normal probability distribution arc length", Adv Ind Eng Manage, vol. 3, no. 4, pp. 35-44., 8M. Olya, H. Fazlollahtabar, and I. Mahdavi, "Shortest path problem with gamma probability distribution arc length", Int J Operat Res, vol. 2, no. 4, pp. 55-66.]. Olya [9M.H. Olya, "Applying Dijkstra’s algorithm for general shortest path problem with normal probability distribution arc length", Int J. Operat Res, vol. 21, no. 2, pp. 143-154. [http://dx.doi.org/10.1504/IJOR.2014.064541] ] analyzed the computational efficiency of the developed algorithm using maximum likelihood estimation and moment generating function in a simulation environment. Fazlollahtabar and Saidi-Mehrabad [10H. Fazlollahtabar, and M. Saidi-Mehrabad, "Methodologies to optimize automated guided vehicle scheduling and routing problems: A review study", J. Intell. Robot. Syst., vol. 77, pp. 525-545. 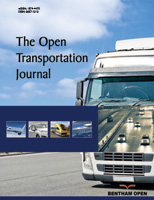 [http://dx.doi.org/10.1007/s10846-013-0003-8] ] categorized the related literature for different scheduling and routing methods of autonomous robots in different problems such as distribution, transshipment and transportation systems. Fazlollahtabar et al. [11H. Fazlollahtabar, B. Rezaie, and H. Kalantari, "Mathematical programming approach to optimize material flow in an AGV-based flexible jobshop manufacturing system with performance analysis", Int. J. Adv. Manuf. Technol., vol. 51, no. 9-12, pp. 1149-1158. [http://dx.doi.org/10.1007/s00170-010-2700-9] ] analyzed material flow optimization for a flexible job shop automated manufacturing system. The aim was to balance the material flow carried by robots through the production stations. M’Hallah [12R. M’Hallah, "Minimizing total earliness and tardiness on a single machine using a hybrid heuristic", Comput. Oper. Res., vol. 34, pp. 3126-3142. [http://dx.doi.org/10.1016/j.cor.2005.11.021] ] investigated job scheduling having different processing times and similar due dates on a single machine for total tardiness and earliness minimization. Ueno et al. [13K. Ueno, T. Kinoshita, K. Kobayashi, and K. Watanabe, "Development of a robust path-planning algorithm using virtual obstacles for an autonomous mobile robot", J. Robot. Mechatron., vol. 27, no. 3, pp. 286-292. [http://dx.doi.org/10.20965/jrm.2015.p0286] ] considered the concept of virtual obstacles in path planning problem and developed a robust algorithm for optimization. Gerstl and Mosheiov [14E. Gerstl, and G. Mosheiov, "Scheduling problems with two competing agents to minimized weighted earliness–tardiness", Comput. Oper. Res., vol. 40, pp. 109-116. [http://dx.doi.org/10.1016/j.cor.2012.05.019] ] considered scheduling problem for competing agents being processed on the same machine and developed a solution algorithm. Igari et al. [15S. Igari, F. Tanaka, and M. Onosato, "Computer-aided operation planning for an actual machine tool based on updatable machining database and database-oriented planning algorithm", Int. J. Automot. Technol., vol. 6, no. 6, pp. 717-723. [http://dx.doi.org/10.20965/ijat.2012.p0717] ] developed a computer-aided operation planning for machines and tools based on database data retrieval concept. Mi’radj Isnaini and Shirase [16M. Mi’radj Isnaini, and K. Shirase, "Review of computer-aided process planning systems for machining operation – future development of a computer-aided process planning system", Int. J. Automot. Technol., vol. 8, no. 3, pp. 317-332. [http://dx.doi.org/10.20965/ijat.2014.p0317] ] studied general process planning using computer-aided mechanism. Hamidinia et al [17A. Hamidinia, S. Khakabimamaghani, M. Mahdavi Mazdeh, and M. Jafari, "A genetic algorithm for minimizing total tardiness/earliness of weighted jobs in a batched delivery system", Comput. Ind. Eng., vol. 62, pp. 29-38. [http://dx.doi.org/10.1016/j.cie.2011.08.014] ] considered a novel complex single-machine scheduling problem and proposed two solution methods. Fazlollahtabar and Mahdavi-Amiri [18H. Fazlollahtabar, and N. Mahdavi-Amiri, "Producer’s behavior analysis in an uncertain bicriteria AGV-based flexible jobshop manufacturing system with expert system", Int. J. Adv. Manuf. Technol., vol. 65, no. 9/12, pp. 1605-1618. [http://dx.doi.org/10.1007/s00170-012-4283-0] ] proposed a bi-criteria optimal path planning in a flexible jobshop manufacturing system. Their model was associated with a comprehensive analytical study on the optimality of the hierarchical decision made by the optimal path method. Fazlollahtabar and Mahdavi-Amiri [19H. Fazlollahtabar, and N. Mahdavi-Amiri, "Design of a neuro-fuzzy–regression expert system to estimate cost in a flexible jobshop automated manufacturing system", Int. J. Adv. Manuf. Technol., vol. 67, no. 5/8, pp. 1809-1823. [http://dx.doi.org/10.1007/s00170-012-4610-5] ] designed a cost estimation expert system using a fuzzy rule backpropagation network that provided the cost estimation in an uncertain autonomous production network. Fazlollahtabar and Olya [20H. Fazlollahtabar, and M.H. Olya, "A cross-entropy heuristic statistical modeling for determining total stochastic material handling time", Int. J. Adv. Manuf. Technol., vol. 67, no. 5/8, pp. 1631-1641. [http://dx.doi.org/10.1007/s00170-012-4596-z] ] proposed a heuristic statistical method to compute the total stochastic material handling times by autonomous robots and to find an optimal path for an advanced production system. Yokozuka and Matsumoto [21M. Yokozuka, and O. Matsumoto, "Reasonable path planning via path energy minimization", J. Robot. Mechatron., vol. 26, no. 2, pp. 236-244. [http://dx.doi.org/10.20965/jrm.2014.p0236] ] investigated energy minimization path planning problem where robot energy consumption was significant for tactical decision-making level. Fazlollahtabar et al. [22H. Fazlollahtabar, M. Saidi-Mehrabad, and J. Balakrishnan, "Mathematical optimization for earliness/tardiness minimization in a multiple automated guided vehicle manufacturing system via integrated heuristic algorithms", Robot. Auton. Syst., vol. 72, pp. 131-138. [http://dx.doi.org/10.1016/j.robot.2015.05.002] ] considered due dates of multiple autonomous robots as a criterion to analyze delay composing of earliness and tardiness; then an integrated heuristic algorithm was developed as a solution method. Fazlollahtabar et al. [23H. Fazlollahtabar, M. Saidi-Mehrabad, and E. Masehian, "Mathematical model for deadlock resolution in multiple AGV scheduling and routing network: A case study. Industrial Robot", Int. J., vol. 42, no. 3, pp. 252-263.] introduced a new concept of a turning point and developed a complicated problem of concurrent routing and scheduling for multiple autonomous production robots. The aim was to provide conflict-free and deadlock resolution. Ishikawa et al. [24K. Ishikawa, Y. Amano, and T. Hashizume, "Path planning for mobile mapping system considering the geometry of the GPS satellite", J. Robot. Mechatron., vol. 25, no. 3, pp. 545-552. [http://dx.doi.org/10.20965/jrm.2013.p0545] ] analyzed the problem of path planning with respect to the geometry of the agents. For further studies on path planning problems and methods, the readers refer to Fazlollahtabar and Saidi-Mehrabad [25H. Fazlollahtabar, and M. Saidi-Mehrabad, "Autonomous guided vehicles: Methods and models for optimal path planning", Springer Int Publ Switzerland, . [http://dx.doi.org/10.1007/978-3-319-14747-5] ]. A production system that contains several machining centers is considered. In any machining center, different types of machines exist to process the required tasks according to the process plan. Robots are used to carry parts to be machined amongst the machining centers and their corresponding machines. A network of machines and paths is configured so that robots move on the paths. The sequence of independent operations is pre-specified. The machines positioned in the same machining center have similar properties such as the same need of operator proficiency, similar functionality, and toolbox resemblance. The objective is to find a path plan for each production robot minimizing total waiting time while the costly collision of robots is avoided. The assignment of orders to robots is handled using a mathematical model. An overview of the problem is depicted in Fig. (1 ). The objective function value obtained from the mathematical model is 72. 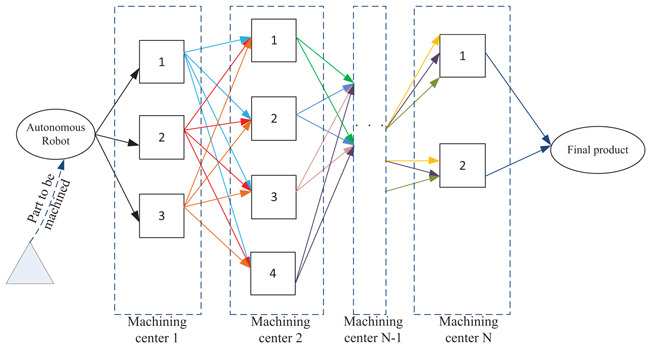 The assignment of robots to machining centers and the path plan is shown in Fig. (2 ). The final assignment of robots to path. Path plan for the example. Fig. (2 ) shows that the first robot is assigned to machining center 1 and then takes the parts to center 2, 3 and 4, respectively and then moves to the depot. Then, robot 2 is allocated to machining center 7 and moves to 6, 5 and finally to the depot. Robot 3 is also called from machining center 8 and takes the final product to the depot. M.H. Olya, B. Shirazi, and H. Fazlollahtabar, "Adapted dynamic program to find shortest path in a network having normal probability distribution arc length", Adv Ind Eng Manage, vol. 2, no. 1, pp. 5-10. M.H. Olya, and H. Fazlollahtabar, "Finding shortest path in a combined exponential-gamma-normal probability distribution arc length", Adv Ind Eng Manage, vol. 3, no. 4, pp. 35-44. M. Olya, H. Fazlollahtabar, and I. Mahdavi, "Shortest path problem with gamma probability distribution arc length", Int J Operat Res, vol. 2, no. 4, pp. 55-66. 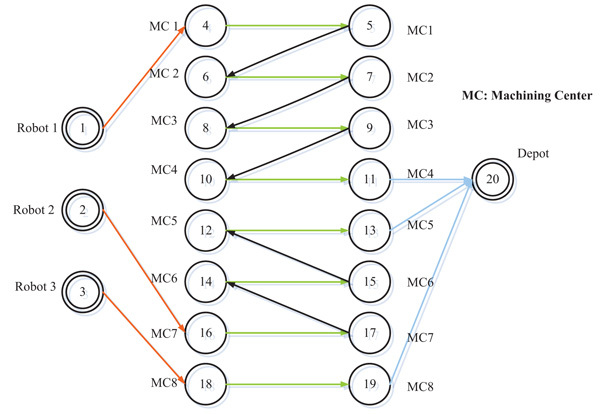 H. Fazlollahtabar, M. Saidi-Mehrabad, and E. Masehian, "Mathematical model for deadlock resolution in multiple AGV scheduling and routing network: A case study. Industrial Robot", Int. J., vol. 42, no. 3, pp. 252-263.